I think it's difficult for Catholics today to imagine how un-involved the people were in the liturgy prior to the reforms that began in the late nineteenth century and culminated with the reform effected by Bl. Pope Paul VI after Vatican II. When it comes to Vatican II I am a firm adherent of Pope Benedict XVI's "hermeneutic of reform in continuity" (see Christmas greetings to the Roman Curia 2005). It was in the centuries between the Council of Trent and the Second Vatican Council that the devotional life of the Church expanded exponentially. A couple of points before proceeding: there are certainly other views about this and I am not a Church historian. In my view, many of the devotions that comprised this expansion were substitutes for participating in the Sacred Liturgy. Things like praying the Rosary during Mass were fruits of this period. 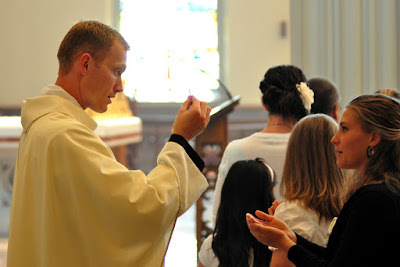 Without doubt, the Church is richer for possessing some of these devotions, but nothing is more central to the faith than the Eucharist, which elicits our full, active, and conscious participation. It is a very good thing to assist at Mass and to pray the Most Holy Rosary of the Blessed Virgin Mary, especially before the Blessed Sacrament, but it is not good to do both at the same time: the Mass trumps everything. You don't have to attend Mass very long or in a lot of parishes to notice that much of the time the laity are still reluctant to fully, actively, and consciously participate, even when encouraged to do so. The answer that many people propose to this is to simply go back to the way things were before, to the status quo ante. Even in the era of Pope Benedict XVI's Apostolic Letter, issued motu proprio, Summorum pontificum, which created a unique situation by establishing a Roman Mass in two forms: ordinary and extraordinary, with the Latin Mass from the Roman Missal last revised in 1962 being the extraordinary form, going back is not the answer. My personal expectation is that at some undetermined point in the future, not likely during the pontificate of Pope Francis, who, wisely, I believe, wants to defuse the divisive and often toxic liturgy wars, there will be a reform of the reform, resulting, again, to having one Roman Missal for the Latin Church. I expect one aspect of that reform will be celebrating the Mass ad orientum. Prior to the reforms, not only in liturgy, but with regard to Scripture, the Church, the Church's relationship to the world, ecumenism, religious freedom, and inter-religious dialogue, orders, etc., it seems to me that the prevailing Catholic mindset with relation to the orders of nature and grace was more than a little mechanistic. This resulted in reducing sacraments to functioning ex opere operato, that is, to the strident insistence that the sacraments "work" automatically with no reference to the faith of the recipient(s). On the contrary, I think the effect of the sacraments in the life of the recipient has a lot to do with his/her faith and disposition. God doesn't withhold grace, but you can refuse it, or block it, if you will. While I agree that the sacraments have an objective character, they are not, in essence, juridical realities, which is the logical conclusion of a reductive ex opere operato mindset, but sacred mysteries that, by immersing us in the Paschal Mystery, draw us into the very life of God- Father, Son, and Holy Spirit. This is not, cannot possibly be, a mechanical function, a magic trick, or something that just happens. Such an understanding runs the risk of possibly positing the Eucharist as fact in the world without much significance. I am convinced that grasping Christ's fourfold presence in the Eucharistic Liturgy, which culminates in him being present as bread and wine, is important to understand: he is present in the assembly of the baptized, in the person of the priest, and, in a manner similar to the bread and wine, in the proclamation of the Scriptures, which enter us through our ears (put down the missalette and listen; lectors proclaim well). God does not force or impose himself on the world, or on us. Rather, in Christ, by the power of the Holy Spirit, God gives himself to us. God's giving requires someone's receiving. In other words, no faith = no sacraments. The Lord himself asked, "when the Son of Man comes, will he find faith on earth?" (Luke 18:8) As with most aspects of orthodox Christian belief, there is a tension generated between our belief in the objective nature of the sacraments and the faith the sacraments both require and elicit. Relaxing that tension on one side or the other not only leads to theological defect and error, but to less than a Spirit-filled life, for life that falls short of the new, eternal life Christ died, rose, ascended, and sent the Spirit in order give us. It seems to me that the matter of how the objective and subjective relate with regard to receiving Communion was very much in play during the Reformation controversies concerning the Eucharist. Thomas Cranmer ultimately settled on an understanding that posited Christ was truly present in Communion only when the recipient has faith. Of course, that is an oversimplified explanation of Cranmer's position, which, while limited, is certainly not a ridiculous position, as a certain contemporary Catholic "apologetic" mindset, which would likely overlook the premises that give rise to this conclusion, would probably hold. But if you really want to play that game, it's no more ridiculous than the aforementioned reductive view that the sacraments "work" in a strictly ex opere operato manner, which strikes me as mechanical and, therefore, reflects a view that very much needed to be reformed. Discussing just these kinds of tensions in the recognition that, as a result of reacting to each other, both sides are prone to exaggerate, is the stuff of fruitful ecumenical effort, the kind aimed at unity, not more dialogue. When it comes to ecumenism, my personal struggle is with those Christian communities the center of whose worship is not the Lord's Supper. I'm no church historian myself, but it's not difficult to find lots of anecdotes suggesting the conciliar liturgical reforms were implemented in haste, inconsistently, and not necessarily in a manner conforming with the documents themselves. I suspect a great many Catholics, having grown weary of the liturgy wars, would welcome a "reform of the reform," as you and others have put it. Widening the availability of the extraordinary form was a good thing to do, but I don't think it has solved or will ever address the core challenge of redirecting the ship and ushering in a broad-based renewal of engagement with the Mass. It seems to me that the great task still ahead is to fully unpack and implement the council's vision for sacred liturgy. When that happens, I wouldn't be surprised if a lot of folks on both extremes of the liturgy wars are disappointed by the results. I agree about the hastiness of the reform, which is why a Reform of the Reform makes sense. Whether the reforms were in conformity to the documents or not, they were within the juridical purview of the Roman Pontiff. I don't share your pessimism regarding the reform in terms of participation in the liturgy, however. Liturgy and catechesis go hand-in-hand. The fallacy of the golden era before the Council needs to be put to rest for good. It hampers ecclesia semper reformanda. There are places, like the Cathedral of the Madeleine that, until recently, are shining examples of conciliar reform. I remember Abp John Quinn, who, after Easter Sunday Mass at the Cathedral a few years ago, said to me, "I think that's what the Council fathers had in mind." In the meantime, we must continue to offer ourselves to God in the Eucharist until we make a total gift of ourselves and stop worrying so much about every little thing. The old Latin low masses were nothing that would stun you. I certainly don't harbor any illusions about any supposed pre-conciliar "golden era." An honest approach to the history of that time shows that the bishops clearly felt some changes were in order and were right in doing so. Attending a "low mass," today, it's hard hard to imagine why. Like I said, I'm glad it's out there for the folks who prefer it, but I don't agree with some who have said the motu proprio would make huge strides toward renewing interest in and understanding of the mass. If that's happened, I haven't seen it. Renewal does not equal simply turning back the clock. As you say, catchesis is a key element there. In my own parish there are efforts to teach about the mass and the significance of its intricacies, but progress has been glacial. That's back to one of my original points: if history is our guide, it will take us a long time to truly unpack the richness of council.